Is this another case of history repeating? Is this just another case of history repeating? Unintentionally, the lads* stumbled onto the theories of historic recurrence and eternal return; philosophical schools of thought that outline a potential cyclical nature of events throughout the course of history, with similar events occurring through a long enough passage of time if given the chance. 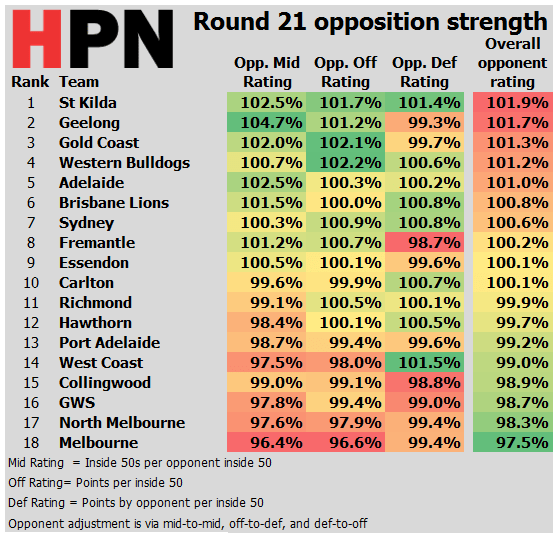 Given the AFL season is drawing to a close, we thought we’d take a look at how the teams have done so far (using the HPN Team Ratings), and whether the question posed by luminaries such as Nietzsche, Machiavelli, Marx and Shirley Bassey could apply to the 2018 Premiership season. 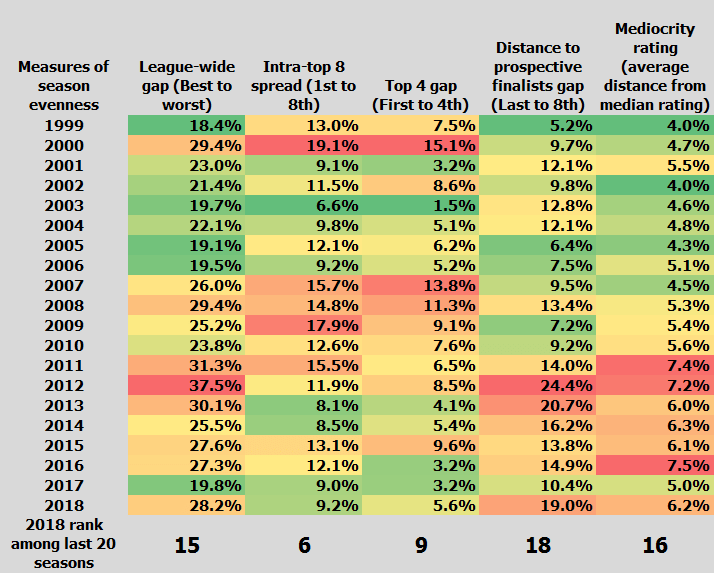 There is a little movement throughout the middle of the ratings pack, with only five sides staying put since the last time we glanced at the ratings in round 15 (Richmond, Geelong, Essendon, Gold Coast and Carlton). Everyone else has shifted between one and three spots on the virtual ladder, but not majorly in any direction. In short, the tiers have been long locked in in this season, especially the bottom 6 pack headed by the Lions. 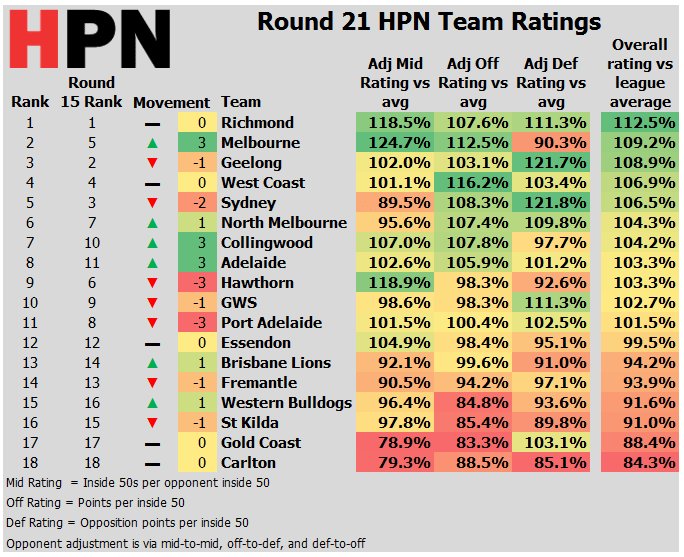 With all the talk around AFL circles of a forgone conclusion to the season, it is no surprise to see Richmond at the top of the HPN Team Ratings. Slightly more surprising, however, is the company they keep in the top two; namely Melbourne. Melbourne’s defence is awful, the third worst in the league by our system, and one that would indicate that the side could not compete with the flag. Premiers since 1998 have, under our rating system, rarely recorded below 105% overall rating, but also very rarely rate below 100% in a specific area. Those that have succeeded in September with a weaker line have generally been covering a sub-par forward line (eg 2005’s Swans and 2016’s Bulldogs). No team with a defence close to this bad has won a flag in the period of our ratings sample. Simply put, Port Adelaide are the best side in the competition against weak opponents and they’re about as good as North Melbourne against the good teams. The story is similar for Melbourne this year, although they are even worse than North against the good sides. While they have a number of close losses against good sides on their books, the Melbourne side seems fatally flawed in defence against good teams. As we noted a few weeks ago, their defensive setup is just way off, lacking accountability and forcing too many players to play roles against type. Melbourne have been helped by a very soft schedule to date; one that will stiffen over the last two weeks, but still leave only Geelong as a potential finalist they’ll have played twice. Two of the other surprise packets of the competition (Collingwood and North) join Melbourne in having a soft draw to date, while relative disappointments in St Kilda, Geelong and the Bulldogs have faced tough draws. (All things being equal, the impact of not playing themselves should leave the better clubs with easier fixtures). 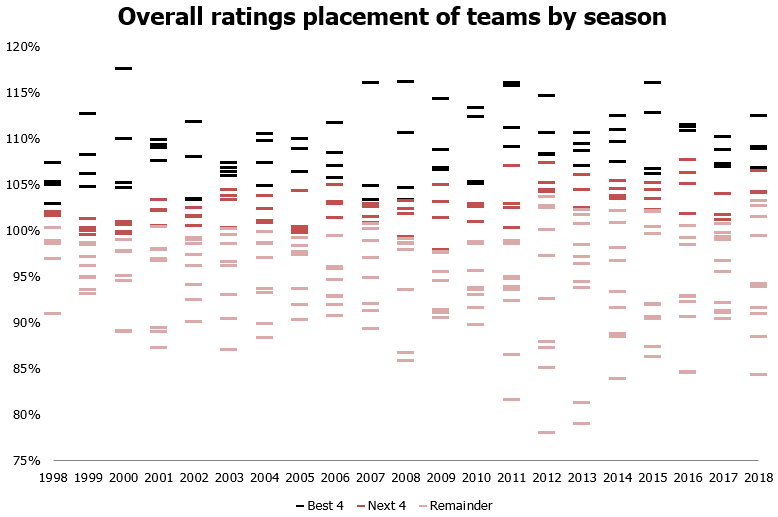 This chart presents all our team ratings back to 1998 sorted by position. A season having a grouping of 12 sides around or above league average is a little abnormal, as is the large gap from 12th to 13th. Where the 2017 season showed the closest signs of league wide clustering in more than a decade, 2018 cast a number of sides adrift and saw parity narrow to just to the okay-to-good sides. We can look at this data in a couple of ways to measure competition evenness or parity. First, here’s a number of figures on various gaps between teams. 2018 is relatively even in terms of the quality spread among finalists but in other measures fares poorly. Its worst teams are nearly as far from finals quality as any time in the last 10 years, and there’s a wider spread of teams from league average than at any time from 1999 to 2010. What’s happened? 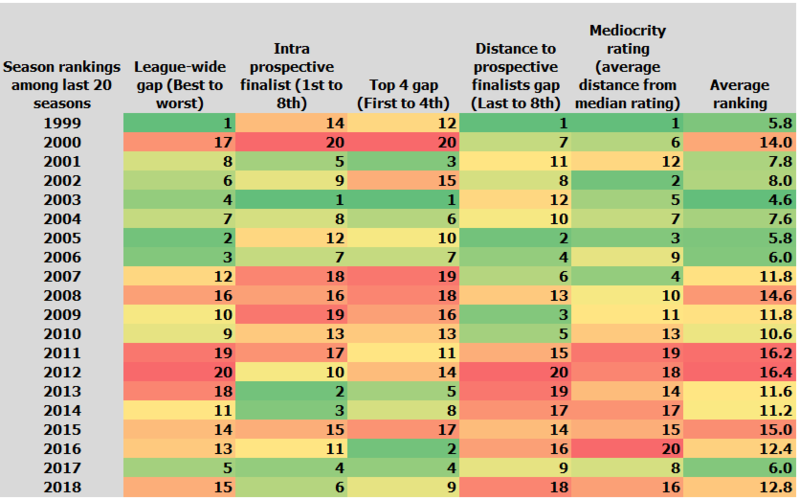 Basically the worst sides have dropped away and Richmond are rating better than anyone did last year. Referring to the notches graph above, we can see that Carlton’s 84% of league average rating, well at the bottom, has recent historical comparisons like the early expansion sides or 2013 Melbourne for company. There’s always a future rebuild ahead, but it is very ugly right now for the Blues. No side between 1999 and 2011 rated as poorly as the Blues currently do relative to league average. Addressing the Richmond question is a little easier to do with that graphical and league evenness context. Richmond sits currently as having the 10th best season for a top side since 1998. They’re about mid-pack for a “best side going”. What’s somewhat unusual is that in being this sort of a relatively average pack leader, they’ve still got a clear break on the rest of the better sides. The landscape, with a relatively average standout over an even chasing pack, seems to most closely resemble a few seasons in the late 1990s and early 2000s. Those include 1999 and 2002 when Brisbane had a similar break on the competition, 2006 when it was Neil Craig’s Adelaide, and 2012 when Hawthorn were clearly the best side. These were all mid-range top sides, as against the historical best-in-league powerhouse sides of some other years. However these sides still had a bit of a gap over the competition in overall ratings. What’s notable is that three of those sides did not win premierships and two didn’t even make a grand final, although three of them were “dynasty” sides more broadly. None of this is to suggest Richmond shouldn’t be favourites for the premiership. They clearly should. It’s just that — and the last two years should have taught us all a lesson in this regard — finals are all two-sided contests and can throw up surprises pretty regularly. No pre-finals side is ever better than say 50% to win a flag. And if Richmond do end up failing to win the flag like several of those mid-level frontrunners before them, to us it seems quite clear that it’s all just a little bit of history repeating. *HPN does not know for sure if the Propellerheads were definitively lads, but being British and in a big beat outfit in the late 90s, the odds are really bloody high. Previous Post:Is Collingwood for real?